El PASO –The immigration detention center for undocumented migrant youth at Tornillo, Texas will remain open into next year, the federal Health and Human Services agency confirmed Thursday. 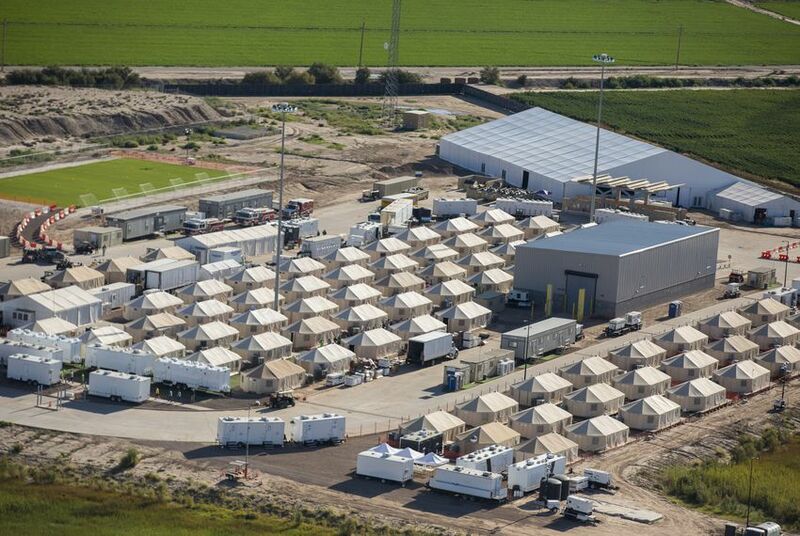 The facility, which critics have called a “tent city” and sits on a remote port of entry in far West Texas, was opened in June to house mainly unaccompanied minors who crossed the border without parents or guardians. At that time the shelter operators were hopeful it would only be needed for a few weeks, but HHS has extended the contact with the shelter operator, Texas-based BCFS, several times since then. The Associated Press first reported the news that the facility would remain open late Wednesday; an HHS spokesperson confirmed news of the extension to the Tribune Thursday morning. Weber added that the facility in Tornillo will not receive any more unaccompanied children and no one currently at the facility is there because of the earlier family separations policy, an enforcement initiative by the Trump administration that placed undocumented adult migrants in separate facilities from their children after they crossed the border. That policy ended in June. As of Nov. 30, BCFS had received just over $144 million from the government to run the facility. On December 25, there were about 2,300 children at Tornillo, about 20 percent of whom were female, according to the most recent HHS fact sheet. Since the facility opened, about 6,200 children have been placed there and 3,900 have been released to relatives or sponsors. News of the latest contact extension comes as lawmakers and immigrant rights groups made a last-minute push earlier this month to have the facility shuttered for good. In June U.S. Rep. Beto O’Rourke and former El Paso County Judge Veronica Escobar led a march of hundreds of protesters to decry the president’s immigration policies and demand more information about the Tornillo facility. In November, Escobar was elected to take over O'Rourke's congressional seat. At a smaller rally earlier this month, O’Rourke said it was incumbent on the immigrants’ advocates to keep a spotlight on the facility to ensure it closes as soon as possible. In addition to the Tornillo facility, the HHS will expand capacity at a shelter in Homestead, Florida from 1,350 to 2,350.